This week has taken you "there" and back. You made it through, though, and as always, you did it in stilettos without missing a step. Celebrate that accomplishment in a pair of festive, multicolored sandals, like Luchiny's "Many Moons" (available for $79.99 at dnafootwear.com- use code SandB to let them know I sent you and to get 10% off any purchase over $50). The bright stripes indicate a happy mood, the gold platform and heel accent add a luxe touch and the ankle strap amps up the sexiness. 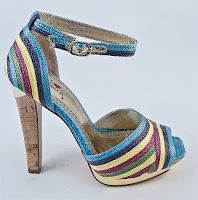 Plus the raffia upper and cork heel serves a bit of seventies chic. They're not the most office-friendly shoe, but they'll look great with jeans or maxi dresses now and a cute romper in the summer. Tonight at happy hour, get the party started with a "Blue Sky" (recipe & image from in-the-spirit.co.uk). The recipe calls for Hendrick's Gin, Dekuyper Blue Curacao, and egg white and a splash of lime juice, but I'd probably ask for it sans egg. It'll lose its creaminess, but it will keep its kick. That means you should consume it with caution. Also, please remember to drink this one with a straw to avoid unsightly blue lips. This shoe is HOTTTT for this summer. The colors are soft and east to match. I'd rock them with a teal colored shirt and some short shorts while holding my blue drink on the beach or poolside!! !